This week I was back in Edinburgh, for a workshop on ‘Geography, technology and instruments of exploration c.1780-1960’ at the Institute of Geography (where I did my postdoc on the British Association for the Advancement of Science). More, I hope, on the paper I presented in due course. This post relates instead to an extra-curricula visit to another newly renovated Edinburgh institution (see my Longitude Blog post on the National Museum of Scotland) – the Scottish National Portrait Gallery. The old place was looking wonderful, especially dressed in its Christmas finery. I have always enjoyed the quaint Scottish National Galleries’ habit of having a tartan-trousered assistant open to door to each visitor (so much more welcoming than automatic doors! ), and it feels particularly apt when they usher you into a richly-coloured, Victorian hall, with Christmas tree and, in fact, the master of the house (aka the director) entertaining a group at its foot. The effect was, of course, particularly lustrous because of the recent cleaning of the murals by William Hole (see this nice video on the work done and the team involved). 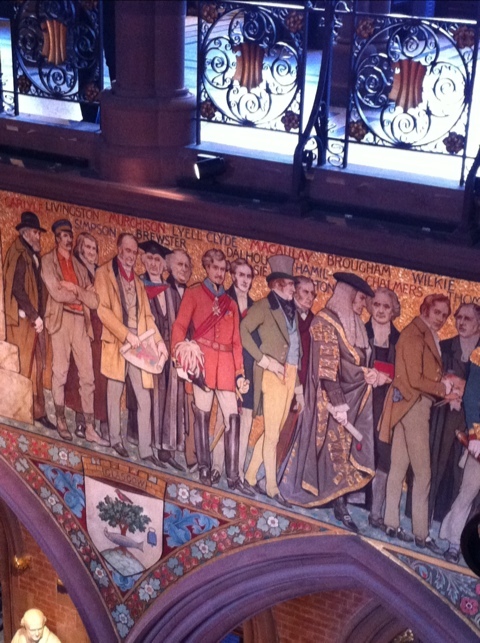 Most strikingly, these include a frieze of famous Scots: kings, queens, writers, engineers, men of science, artists and politicians from prehistory to mid-century. It is, as said on the video, Scotland’s Valhalla. I picked out this angle to get in two of the historical figures who, as well as having sported tartan trews from time to time, featured prominently in my book as men of science who played a role in the depiction and celebration of Newton in the 19th century. They also link into a host of British institutions, from the BAAS to the Edinburgh Review to the British parliament. One is Henry, Lord Brougham, the other David Brewster, who was born on this very day, 11 December, in 1781. They were friends and colleagues, working in the field of experimental optics, as well as public figures – Lord Chancellor for Brougham and Principal of the University of St Andrews for Brewster, as suggested by the robes shown here. Also in this shot is David Livingstone (I presume) and Roderick Murchison, both apt in honour of this week’s geographical workshop, as well as Charles Lyell and more. Just out of shot is George Stephenson (given as Stevenson) holding a model lighthouse [correction: this is, of course Robert Stevenson, the lighthouse-designing civil engineer and not George or Robert Stephenson the (English) railway engineers], and Mungo Park (who wrote a letter to Astronomer Royal Nevil Maskelyne that I discussed in my talk in Wednesday). Elsewhere, of course, we have John Napier, John Hunter, James Hutton, Thomas Telford and James Watt betwixt and between the likes of Burns, Boswell and Scott, Adam Smith and David Hume, Dundas and Wilkie. 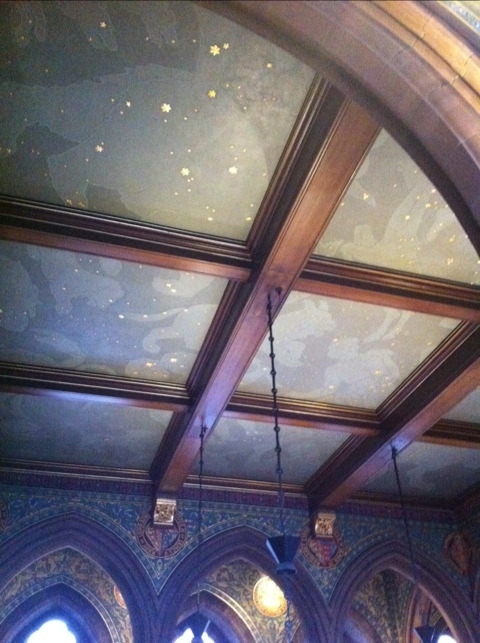 Something I had not previously noted, however, was the ceiling of the Main Hall, probably because it was so dingy until the recent cleaning. It turns out to be a celestial map of the northern hemisphere, with the stars in gold and the imagery of the constellations in deliberately low-key shades of blue on blue. There are, apparently, 2222 stars, and the gallery would be delighted if you would consider adopting one. I have developed a bit of an interest in William Hole, the artist, because it turns out that he once lived in the house my mum moved into a few years ago – complete with artist’s studio at the end of the garden. He is considered a peripheral pre-Raphaelite, admired for his engravings and a stalwart of the Scottish Royal Academy exhibitions. Interestingly, before a period of European travel and his return to Edinburgh for his artistic training, he was an apprentice civil engineer. It was obviously not to be his calling, but his depiction of several engineers with their models and drawings suggests he still saw it as a noble calling, and part of Scotland’s national genius. He was also deeply religious, and Scotland’s spiritual past, from Druidary to the first Christian missionaries and saints, stands here too, beneath the grand history and battle murals on the first floor and the northern skies rising over all. Just beyond these first floor murals, there is currently a small area of the galleries devoted to a display called Pioneers of Science. I imagine that they could have filled a very great deal more space with the Scottish science, medicine and engineering portraits in the collection than the small selection shown here. It is a taster only, which is perhaps apt for a reopened, redisplayed gallery, and I look forward to future large exhibitions that continue to explore such themes as the SNPG has done in the past. Here, in the mean time, you’ll find a bust of Alexander Flemming cheek by jowl (as it were) with a taxidermist’s death mask of Dolly the sheep (courtesy of the NMS). It is difficult to make any very profound comments about the selection. Several are obviously chosen for the renown of the individual or their achievement – John Logie Baird, Lord Kelvin – but several are rather less famous. Those of chemist James Dewar and embryologist Bill Ritchie are evocative in depicting the equipment and working spaces of laboratory science in the early 20th and 21st centuries respectively. You can see these and several other images from the display here. The largest painting, and the one that is used for the flyer, takes the viewer somewhere quite different from the rather standard images surrounding. It is Ken Currie’s 2002 Three Oncologists. I have seen it before, but it remained for me a genuinely striking, not to say fear-inducing, painting. It is a portrait of three distinguished professors – RJ Steele, Sir Alfred Cuschieri and Sir David P Lane – of the Department of Surgery and Moleular Oncology at Ninewells Hospital in Dundee. Rather than being celebrated as distinguished pillars of the medical or, indeed, social establishment, they are ghostly, horrible figures, luminous against a dark background, disturbed in their work, with stern or depressed faces and blood, literally, on their hands. As the caption says, it is full of the “horror and anxiety associated with cancer”. I wonder what these men made of their portraits, and the overriding negativity toward their presumably preferred self-image as healers or caregivers. There is plenty of Burke and Hare and Jekyll and Hyde here, to suit the Edinburgh location. For me, the image seems to be full of the kind of fear people have of the word cancer before their or a loved one’s diagnosis. When it becomes reality the horror ends up being so much more full of ordinary everydayness, nurses, hospitals and, ultimately, of the sick person than the senior specialists. However, the painting is certainly testament to the very different role of and expectations surrounding portraiture in the 21st century. A long, long way from the vision of William Hole or the gallery’s founding inspiration, Thomas Carlyle.